(The Root) — Jim Crow, that feisty fictitious character that symbolized segregation in the South for decades, is alive, well and on the ballot in Alabama in Tuesday's general election. And depending on whom you ask, he may just win again. 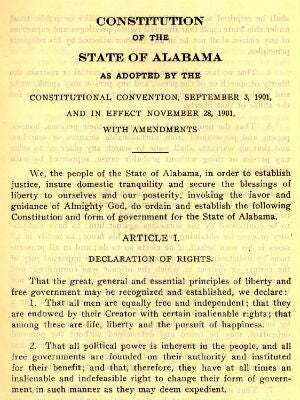 Since 1901 the Alabama Constitution has included language that requires separate schools for whites and blacks and puts in place poll taxes that often prevented blacks from voting. Arthur Orr, a white senator from north Alabama, successfully pushed legislation in 2011 to give the people an opportunity in the general election to remove the segregationist language from the constitution. But not a single black lawmaker voted for the measure. And many blacks in the state, along with the powerful Alabama Education Association, are now fighting Amendment 4, which would strike Jim Crow from the constitution. "If we approve Amendment 4, striking the Jim Crow language, we'd also be taking away from all of Alabama's children the right to a free public education," says Alabama state Sen. Hank Sanders, a Selma Democrat who is black. "To some, seeing blacks take this position may look bad. But it really is good because it shows we aren't fools who will take this wolf in sheep's clothing that means us no good," says Sanders, a lawyer and longtime fixture in state politics. Removing the portion of the constitution that requires separate schools and provides the right to free public education would open the door to vouchers and charter schools, Sanders says. Those changes have been met with stiff resistance from many black lawmakers and from the AEA. Bills to establish charter schools in Alabama did not pass in the 2012 regular session of the Alabama Legislature. Orr says that charter schools and vouchers have nothing to do with Tuesday's vote on the amendment. "If the Legislature wanted to approve charter schools or vouchers for Alabama public schools, it could do so without the amendment I proposed to the state's constitution," Orr says. "I just wanted to give the people of Alabama [an] opportunity to come together and show that we have an Alabama different today than it was 50 years ago. "I've been told on several occasions by people in economic development that this language works against us because it dredges up stereotypes of the past," he says. "This vote is more symbolic because segregated schools were outlawed with the 1954 ruling in Brown v. the Board of Education, and poll taxes were outlawed later by the Voting Rights Act." State Rep. Demetrius Newton, a Birmingham Democrat, agrees that the racist language establishing segregated schools and requiring poll taxes should be removed from Alabama's constitution. "But the amendment on Tuesday's ballot takes away more than the language," he says. "If they wanted to, they could have proposed legislation that removes the language without taking away the right to public education. If this does not pass, I believe the Legislature will come back and pass laws to do just that." Tuesday's vote will mark the second time that voters in Alabama have taken up the issue of racist language in the state constitution. A similar measure failed in 2004 after a different set of opponents objected, saying that certain language in the amendment would result in increasing the cost of public education, according to Sanders. The summary for Amendment 4 on Tuesday's ballot reads: "Proposing an amendment to the Constitution of Alabama 1901 to repeal portions of Amendment 111, now appearing as Section 256 of the official recompilation of the Constitution of Alabama 1901, as amended, relating to separation of schools by race and to repeal section 259, amendment 90, and amendment 109, relating to the poll tax (proposed by Act 2011-353-03)." "That summary, however, does not include for the voters the other language attached to law that says, 'Nothing in this constitution shall be construed as creating or recognizing any right to education or training at public expense,' " Sanders says. And that's the part that causes problems for opponents. The nonpartisan Alabama Law Institute, in a letter to Orr dated Oct. 15, said that Amendment 4 makes no change to the state constitution other than striking the racist language. According to the letter from institute Director Othni Lathram, the portion of the law that relates to funding education has already withstood court challenges and is not on the ballot. For Orr, a yes vote on Tuesday for Amendment 4 says it's time for Jim Crow to go away for good. But for Sanders, a no vote means that Alabama needs to keep the right to public education, even if it means Jim Crow continues to tag along in its constitution. Denise Stewart is a freelance writer in Alabama. Follow her on Twitter.